Tinos Island is a beautiful, authentic island in the heart of the Aegean Sea in Cyclades in Greece. Easy to reach, Tinos is 20-25 minutes by boat away from nearby Mykonos (Arrival at Mykonos International Airport) or alternatively, 2 hours by speed boats or 4 hours by conventional boats away from the port of Rafina (the closest port to Athens International Airport – 30min.) and the port of Piraeus (Arrival at Athens International Airport). A Helipad, just 800 m away from the estate, offers even easier proximity by helicopter. Fast ferries and conventional boats depart regularly from the port of Tinos to the main ports of Athens, Piraeus and Rafina and to the rest of the Greek Islands, offering visitors easy access. Tinos is directly opposite to Delos Island, one of the most worth-visiting archaeological sites of Greece that reflects the brilliance of Greek antiquity until today. As part of the Cyclades islands, Tinos is a beautiful Greek island that remains authentic, with long tradition in art, as homeland of great Greek sculptors and painters. Apart from majestic sandy beaches, never-ending scenery and herbal aromas, Tinos Island is an ideal location for thematic holidays, as it offers a great variety of activities. More than 60 villages and 1500 orthodox and catholic chapels and churches with intense cultural activity are scattered all around the island, creating a real treasure worth discovering. Concerts, exhibitions, theatre, museums, art workshops (pottery, marble art, and basketry), local festivals “panigyria” and fine cuisine promise to keep you pleasantly busy whilst discovering the island. Activities like swimming, diving, windsurfing, trekking, horse riding, bicycling, bouldering, climbing and fishing may attract your interest. Romantic sunsets, spectacular sunrises, impressive moonrises and breath-taking views to the Aegean Sea are some of the photos you will take and treasure. Holidays on Tinos Island are holidays to remember! Tinos has a coastline of more than 120kms and hosts some of the most beautiful seashores in Cyclades. Some of them are organized with beach bars, activities, taverns, sun beds and umbrellas, while others are completely unspoiled. As the island is situated in the heart of the Cyclades in the Aegean Sea, it’s easy to take daily excursions to the nearby islands; Mykonos, Syros, Paros, Andros, Koufonisi or Dilos, which is a significant archaeological park. For your local cruises you can either rent a Super Rib or motor boat, or use the daily scheduled ferries and sea jets. Food on Tinos island is very tasteful and of good quality, as many products like cheese, honey, vegetables and herbs are produced on the island by local farmers. Tinos island cuisine follows the Mediterranean concept; pure olive oil, several fish and meat dishes, a variety of vegetables and fruits, all enhanced with flavorings that include herbs and spices like oregano, mint, onion, garlic, dill, basil, thyme and laurel leaves. There are many good taverns and restaurants, as well as good wineries that produce exceptional wines that are also exported abroad and a local brewery that was awarded at international level. 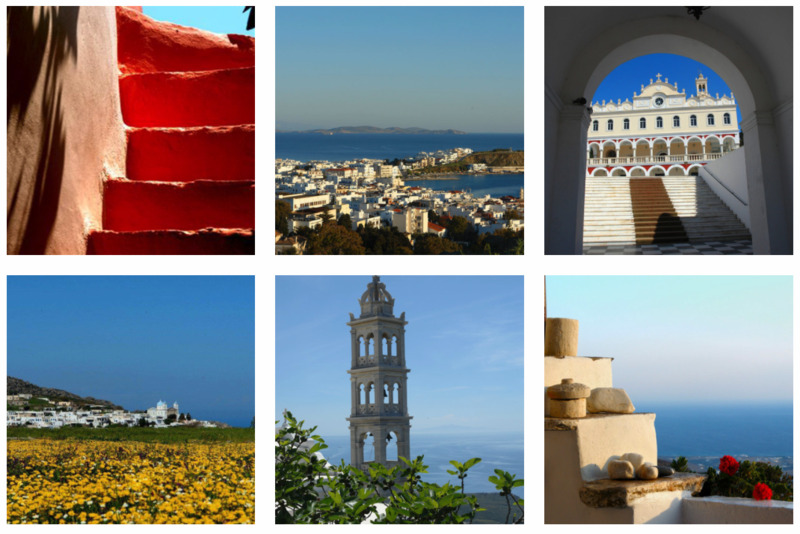 During the last years, Tinos has become a gastronomic destination with "Tinos Food Paths" being the most interesting event organized on the island every year. Tinos is widely known for the miraculous icon of “Our Lady of Tinos” (Virgin Mary) that was found on the island in 1823, which is kept in the famous Church of Panagia Evangelistria, one of the most important Orthodox shrines. Going back to ancient times, the ruins of the temple of Poseidon indicate that the God of the Sea was worshiped on the island, according to Greek Mythology. In the town and port of Tinos Island (5-minute drive from the Estate) you can find stores for your daily needs; bakers, grocers, supermarket, butcher, fishermen and a daily street market with local products of top quality such as variety of cheese, honey, wine, home marmalades, dried tomatoes, capers and artichokes. You can buy souvenirs and small presents in the main street. There is also a great variety of local sweets in pastry shops. If you are looking for more shopping, one can always have a day trip to the nearby cosmopolitan Mykonos Island, just 20 minutes by boat or sea jet, where you can find the finest boutique shops and well known brands.